With Easter just a day behind us we are still basking in the memories of the blessings of yesterday. Jonathan had a Seder Supper with the whole church for Easter service and so many were blessed. It was so amazing to see people draw correlations from the Old Testament to the New Testament concerning the practices of this Seder Supper. Knowing that the Jews don't recognize Jesus as their Messiah, we as Christians can clearly see Jesus wrapped in every bit of the ceremony. It was amazing! I would have to say the highlight for me was watching a sweet woman in our congregation named Phyllis leaning forward and hanging on every word that was being said, taking notes. It was fun to watch the kids search for the hidden bread and see their excitement as they traded their found treasure for chocolate. Benjamin, now 20 months old was searching with the other kids completely unaware what the other kids were doing but he sure knew when it was time for chocolate! He began squealing in excitement and searching for the place where he saw Jonathan hide the chocolate. What an amazing day! With the rains that have finally made it, we have had an influx of bugs. Poor little Benny got a bug bite on his arm that got infected and basically looks like a huge boil covering about 1/3 of his forearm. He's now on antibiotics and we are hoping it gets healed soon. With the rains, we always seem to get these flying termites (you might remember a post we had when we were at language school, where I had taken a picture of a pile of termite wings...bleh! )but we have witnessed "June bugs" coming in ENORMOUS proportions. Just this morning when I opened our front door, I witnessed THOUSANDS of June bugs dead on our porch. Thousands. It's nightmarish. I think they are mating at night and then dying? I don't know I have to look it up. Update on Jonathan and the accident: We are so glad that Agnes, the girl who was hit is okay. She doesn't have recollection of the accident at all so she had called Jonathan a few weeks ago to ask what had happened. She told Jonathan that she's praising God that He allowed her to survive the accident and she's telling everyone what God has done for her. After Jonathan spoke with her over the phone he said he felt as if a weight had been lifted off of his shoulders. His anxiety about driving and the accident seemed to really cool down. Please keep us in prayer for safety on the road. Just the other day I saw a man dart out from behind a huge truck and he didn't even look to see if their was traffic. I thought I was about to witness a horrific accident but praise God the car that was about to hit him braked barely in time. The pedestrian who had darted out kept a big grin on his face and trotted across the busy road as if he was not about to meet eternity. Mind boggling. Last year, Calvary Chapel Missionaries/ministry leaders in Kenya gathered together for a retreat where we were refreshed and renewed. Next week will be our second Calvary Chapel Missionaries/ ministry leaders Retreat. 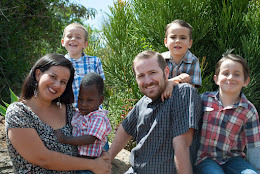 We are so excited to meet new families that have come this year and reconnect with friends serving in different parts of Kenya. God is doing an amazing work here in Kenya and it's amazing to be a part of it. Much love received! We went to the post the other day looking for an Easter package my grandma and sister had sent and although it hadn't come, we were surprised to get a couple SWEET packages from our fellow "Refugees", the Hinrichs Family and the Shuerke Family. The kids were blessed with some new books, some cool "grow a bug" little plastic bugs that turn enormous when we put them in water (just in time for the rains! ), and a really cool letter from The Shuerke (yikes, spelling??!!!) family who blessed us with some books for the kiddos and enormous encouragement. Thank you so much, Refuge Family for praying for us and sending us sweet gifts of love and encouragement. The kids have been talking about their friend, Wyatt, in America, and asking us what we think Wyatt likes. It's so cool to have those connections even though they've never met! Our God is so good! If you are reading Shuerke Family and Hinrichs Family , thank you so much for the blessings! "If there's such thing as too beautiful If there's such things as too wonderful If there's such thing as too marvelous Jesus it's You, Jesus it's You"